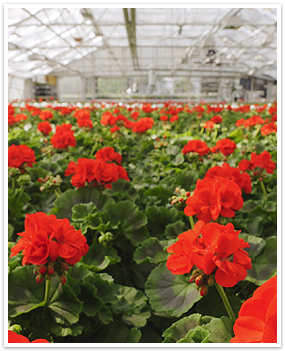 Hilltop Greenhouses is a wholesale nursery operation in beautiful Victoria, British Columbia. We have been growing plants on Vancouver Island for over 40 years. Solely owned by Richard Murray, Hilltop has a professional team who strive to offer only top quality plants throughout the year. From bedding plants in spring to Poinsettias at Christmas, we are constantly sourcing the latest trends and genetics to find what works best for our customers. Growing plants is our passion and providing the best customer service is our goal. We are proud to say our product is grown on Vancouver Island. Because our clientele now reaches beyond Vancouver Island; we’re happy to say we get to share a little bit of our Island passion with them as well. We want our customers to be happy, both with our product and our service. We expect our customers to tell us how we are doing, good or bad and we in turn relay this to our staff. We’re not satisfied until you’re satisfied.